Badly organized. Tour guide was studiously avoiding to explain the sights and did not seem to be interested in keeping the group together. This tour is made out of three separate tours and we were left standing without explanations or how long we would have to wait and why after each part of the tour as our tour guide just left us standing. The Unusual Venice tour was overbooked and it was difficult to follow the guide with so many strangers among hundreds of tourists. I didn't see the guide for probably 50 of the walk and she never gave directions through the headphones we had. Some people even left during this part because it was just plain awful. Due to the amount of people and poor organization it took more than an hour to get everybody in the gondolas and than most of them got stuck in traffic jams in the canals. Complains to the tour company were shrugged off. The wait for the gondola ride at the end was very long especially after doing the other two activities first. We had to wait for nearly an hour for our ride. Priority should have been given to those who had done the other two activities prior. Milo helped my husband find our hotel to drop our luggage we just arrived and he helped my husband carry the luggage too! Took a little while to adjust the sound equipment and reception was not particularly good around Venice but guide Veronica very knowledgeable. Gondola ride was a lot longer than expected around the canals. This was supposed to be the most exciting part of our trip to Venice. When we first arrived we were assigned an ;English speaking tour guide, with extremely broken English. Now, I completely understand that I am in a different country, and there can be variances of a language , but I am paying for an English tour. It was so hard to understand the tour guide I had to pull my headphones out and read the signs throughout the castle which takes the magic out of the tour. And it is not like I am not accustomed to languages because I speak Spanish and travel three times a year. The tour guide was refreshing and her facts on Wikipedia before starting , and moved so fast through the museum that she had no regard for crowds that pulled our group apart. Towards the end she realized she was tight on time and ran through the most interesting parts of the underground bridge and jails. When we finished we were to be guided through the city tour. Some members of the group had left to use the bathroom and others had left completely because they didn't have the next tour included. At this point I would have rated it three stars because even though I could not understand a word she said , she was talking through out the whole tour and I know 1/2 the people understood her at least. However , she decided to just walk away with a few amount of people following her , and I yell to her if we are supposed to follow since she is already a street away? She rudely says yes as if I'm supposed to lead myself , and other families follow behind me. She argues that we are late and there 's only one bathroom break for the others behind. As far as I'm concerned, a tour guide should have enough time management to accommodate for this, and should also be accountable for everyone . She kept saying that she had no idea how many people were supposed to be there and that's a tad concerning. I have traveled all over and have never heard of a tour company that was not accountable for their people. Overall she had a demeanor about her that made you think that you were a lower class than she was, and was not a pleasant entertaining guide. Anyway I was lucky enough for a new tour guide through the city. Yet the company thought it would be best to book for 42 people. So this time our guide knew there was 42 people, but if you know anything about Venice that is a nearly impossible number to attend a walking tour though San Marco. I have to say that this woman was very enjoyable and the tour was much better with more humor, history, and better English. Then someone's young child went missing . I sprinted to the front of the line to stop the tour guide and have her talk through the microphone for the girl, since her parents ran back to the last place we were. By this point the voice was out of range. This city is incredibly confusing for even the savviest traveler. My brother had sprinted with the family to look for the girl and we thought the tour guide could spare 5 minutes of waiting to look for the child. However, she just kept moving. So now the family was gone , and my brother . My mom and I decided to see where the ending spot was since we were supposed to take the Gondola tour next . The problem with this situation is, is having no cell phones while traveling. We only had wifi so it's not like we could just call everyone up. I had my mom wait in the spot so I could run back and meet the family to guide them back. While my mom was waiting the tour guides were badgering her about needing the microphones , and how we are accountable and they will need the room information, with no concern for two lost children. The tour guide was going to receive a tip until she dashed away after the tour. I wonder what was more important for her ? I will say though, even though the first tour guide was rude to others , and seemed inexperienced she did have a heart for the child and was on her way to search as well. There ended up being other people on the street and another tour guide company that sprinted up a large spiral staircase just to see if the child wandered to the top, yet our company was biting their fingernails over a radio.When I found the family , everyone was reunited and I walked them back to the center which was more than just a street turn. After finally being reunited we waited in line for the gondola. This is after my mom was told we lose this opportunity if everyone wasn';t strictly there at 5:15. Impressively we were able to find the girl and each other within that time, but there was no concern at all for this family. The ride was a beautiful scenic ride , but be warned this is a tour and they will herd you on like cattle to fit the gondola. If you plan on traveling as a single family or couple for a romantic ride I would not suggest this. Overall, I could not be any less impressed with this company and the way the handles multiple situations. For what could have been an enjoyable day was stressful and exhausting. I would highly recommend doing private tours or booking the castle with the audio box translator. I can not believe the lack of emotion and concern I experienced on this tour , and for such a touristy area not one guide seemed qualified. Take your chances with this tour, I was completely disgusted by the end. This is a combo of 3 tours. For the first 2 tours, we had Gina, a native Venetian, as our tour guide. She was excellent! We lucked out with a smaller group than they normally run so she was more accessible. 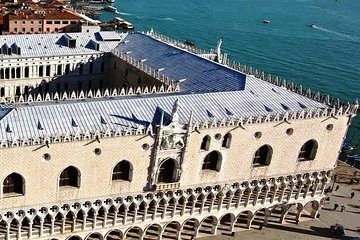 The Doge's Palace is interesting and the walking tour took us primarily in the San Marco neighborhood. Gina was able to provide insights and great information. If there's any negative, it was that it felt a bit rushed going from one tour to the next - not enough time for the restroom. For the gondola ride no more guides, be aware that each gondola takes 6 people and there's A LOT of people going on the gondolas! They take the bigger groups first so if you're travelling solo or as a couple, you could be a filler for the group gondola and you can forget about the great seat. If you can wait until there are no more big groups, you'll have a better chance of getting the great seat. The ride itself was really relaxing and enjoyable. Pretty quiet and no singing though the gondoliers were talking to one another as we passed them.